When a yoga studio truly is an oasis of calm, there’s something about the experience you have on your mat that’s irreplaceable. On the best days when you feel like you could fly, and on the worst days when you just need to get to your mat, a yoga studio can become your home away from home. You’ll practice in a state-of-the-art studio with world class instructors, get a sampling of everything that Yoga2.0 offers, and enjoy Michelob ULTRA cocktails, bites from Foxtrot and more while you recover post-sweat with REVITALAB. We hope you’ll join us on your mat! The team who built this sanctuary left no stone unturned. Yes, you’ll find that it’s a beautiful fitness space with class offerings Strength, Flow, and Revive. And yes, you’ll be wowed by the copious amount of locker room space, amenities available, and open lobby area that welcomes you to stay and enjoy the studio before and after class. But even more than that, you’ll feel at home once you set foot inside class; the studio was made out of love and created from the desire to elevate the yoga experience through and through in Chicago. 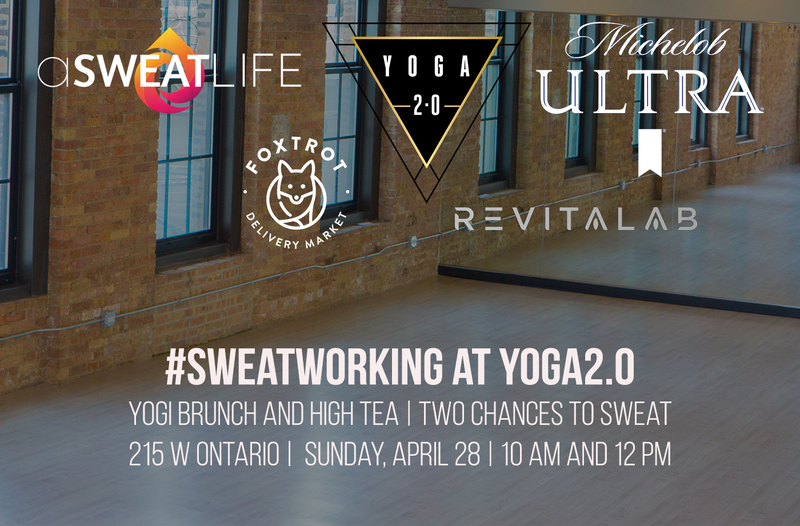 What’s happening at #Sweatworking at Yoga2.0? To welcome this new yoga space to the River North neighborhood of Chicago, aSweatLife is hosting two back-to-back classes on Sunday, April 28 – at 10 am and 12 pm. In class, you’ll experience 25 minutes of each of the three class, Strength, Flow, and Revive, for a total of 75 minutes on your mat. After class, you’re invited to stay for tea, brunch bites from Foxtrot, and Michelob ULTRA cocktails while you enjoy recovery services from REVITALAB. Get you tickets to the 10 am #Sweatworking class here. Get your tickets to the 12 pm #Sweatworking class here. We can’t wait to see you for the most Sunday fun-day imaginable! All the details in one place, please! Where do I grab tickets? Right here for 10 am, right here for 12 pm.